Verizon, the largest carrier in the US by subscriber count, has just announced that it is adding the new Motorola Moto G4 Play to its prepaid roster. The addition of an entry-level device isn't something that would normally make the news, but in this case, we're intrigued by the price, just $85 without a carrier contract. 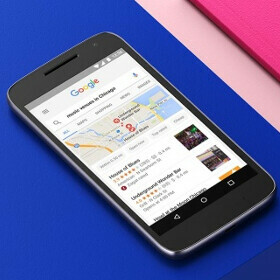 The Motorola Moto G Play, also known as the Moto G4 Play is the smallest and the cheapest of Motorola's new phones, featuring a 5-inch panel running at 720 by 1280 pixels. The handset includes specs such as a Qualcomm Snapdragon 410 chipset with a quad-core CPU, 2GB of RAM, and 16GB of integrated storage with support for microSD cards. That's a decent setup given the price and the processing power should be enough for basic tasks. In the imaging department, the Motorola Moto G4 Play is equipped with an 8MP primary sensor with an f/2.2 aperture and a 5MP selfie shooter on the front. All of these specs are powered by a 2800mAh battery. On the software side, the phone runs Android 6.0.1 Marshmallow with only limited modifications on Motorola's behalf. Sep 06, 2016, 9:12 AM, by Florin T.
May 18, 2016, 3:04 AM, by Victor H.
At $85 with no carrier contract, the Moto G4 Play definitely offers a lot of value. If you need a backup phone that isn't completely outdated, consider it as an option. Unlocked, the handset is priced at $149.99, but Amazon Prime subscribers can also get it at $99.99 with preloaded ads. What do you guys think of this Motorola Moto G4 Play price? Is this phone worth $85? G4 Play comes with 1GB here. Does Verizone version support all bands/frequencies?. if so $85 will be good deal..
.....with a heck of a lot of modifications on Verizon's behalf. Would this be able to work on a GSM network?